We are Kelly and Mike, and after being together for nearly 20 years, we’ve decided it’s time for us to start a family through the beautiful journey of adoption! 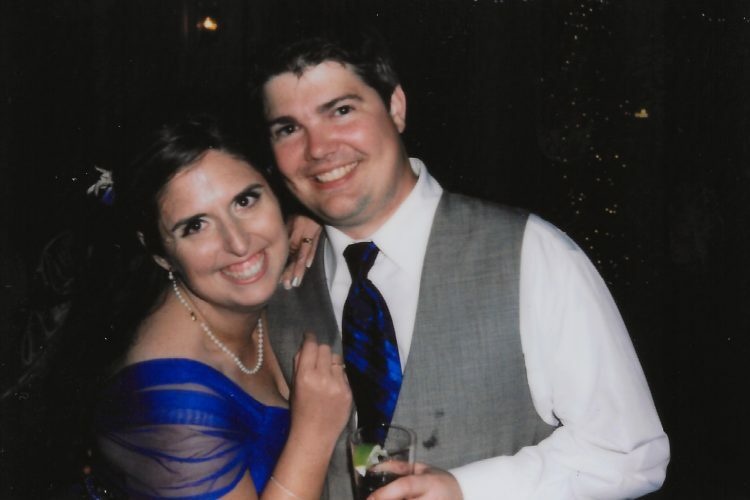 We met in high school, long-distance dated through college, and got married after graduation. 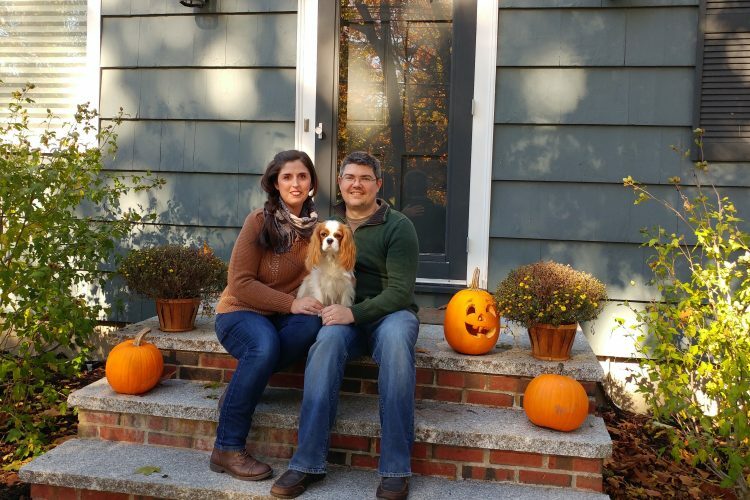 After getting married, we moved from our hometown in Canada and started creating a life for ourselves in the U.S. Now, we’ve been happily married for more than 11 years and we live in a suburb of Boston in a Cape Cod-style home with our sweet dog, Millie. After a few years of marriage, we felt it was the right time to start a family. Unfortunately, after several great losses, we learned that we are unable to bear children. Adoption has been in our hearts for a long time, and we know now that, through the strength of an open-hearted person like you, it will be our path to parenthood. Kelly currently works in the theatrical arts in a very part-time position, while Mike is a professor/scientist. 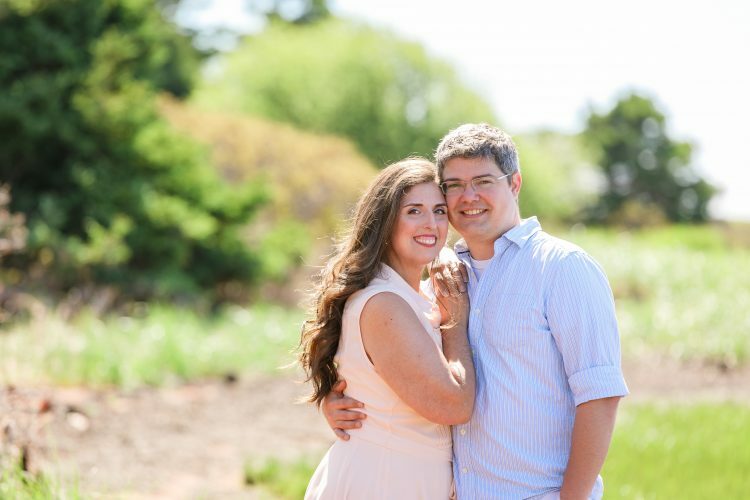 We are lucky that Mike’s job is incredibly flexible, so he will be able to be there for all of the important moments in our child’s life, while Kelly will be able to fulfill her lifelong dream of becoming a stay-at-home mom. Please know that we support you in your search to find the right family for your baby; we also know that, even if you do not select us, you will be making the right choice. We don’t know how you came to this huge decision, but we do know that it probably wasn’t easy. Thank you for your bravery and for the love you are showing for your child in considering placing them for adoption. The first thing you should know about us is that we have been friends for over 20 years, a couple for 17 years (we even went to senior prom together), and married for 11 years. Being friends throughout high school really helped our relationship develop at just the right pace. Back then, it sometimes felt like we just fell head-over-heels in love all at once. However, looking back on things now, we realize that we actually got to know each other over a long period of time. We feel truly grateful that we got to know everything about one another as friends before moving our relationship to the next level! Despite having been together for half of our lives, we still treat every day like it is the beginning of something new and exciting. From time to time, we are even still surprised by the way one another thinks. Our brains work very differently (Kelly is the artist and Mike is the scientist), so we think and react very differently from each other. Though some couples would struggle with having such different viewpoints, we’ve found that it really helps us consider things from all angles and it makes us an amazing team; we are able to let each other’s strengths shine and pick up the slack for the other when we know something is one of their weaknesses. We love to spend time together, whether it’s going somewhere fun or just being silly and laughing together! We also love just spending time at our home with our friends and family. We have always taken pride in the place in which we live, whether it was our first studio apartment together in Washington, DC or our current home in Eastern Massachusetts. Because of this, our home has always been a place where our friends and family from around the world feel welcome. The road to creating our family has been a bumpy one. We had multiple early miscarriages, and then sadly lost our daughter, Lucy, who was stillborn at 6 months. Prior to this loss, we had always planned on adopting to grow our family further. After this loss, though, adoption truly began growing more and more in our hearts as the way that we wanted to create our family. From trying to conceive, to the challenges of IVF, and now to our adoption process, we have always been united. Each step we take, we take together, with no need to convince the other that we are doing the right things for us. As we mentioned earlier in our letter, Kelly has always dreamed of being a stay-at-home mom. She has dreamed of making cut-out sandwiches, face painting, and reading bedtime stories her whole life. She has Pinterest boards full of crafts and activities for kids and loves making special moments for the children who are already in our lives (like our nephews and cousins). She can’t wait to welcome a child into our lives so she can begin doing some of these fun things with a child of our own. Luckily, Mike has an amazing career that will allow him to support Kelly staying home to care for our family. His job is also flexible enough that he can work from home one or two days a week, allowing him to be a partner in childcare. His unique career, as a scientist and professor at a Massachusetts university, also provides opportunities for family-friendly travel around the world, which we have taken advantage of as a couple and hope to continue to as a family once we adopt. Adoption has touched our lives more than we originally realized when we began our family building journey. We’ve discovered that half of the members of our close friend group were either adopted themselves or have siblings that were adopted. Because of this, we’ve been able to talk to people who were adopted, as well as parents of children who were adopted, to learn about their experiences. In all of our learning, we’ve come to understand how adoption is one of the greatest expressions of love – both for adoptive parents and birthparents. We have endless amounts of love that we are ready to share with a child. We also hope to have a positive connection with you, if you select us as your child’s adoptive parents, so that he or she can know where they came from. While our journey to creating a family has been challenging, it has also shaped us into the people that we are today. It has taught us that nothing is guaranteed, and to enjoy the blessings that we do have. We hope that these blessings will continue to grow and that our story continues to be a page-turner. If you can imagine a combination of Mary Poppins and Beyoncé, then you can imagine Kelly. Like Ms. Poppins, Kelly excels at nearly everything, to the point that it seems like magic. She is a master baker, a warm host, and a selfless friend. She has music in her soul, often spending evenings plucking away on the ukulele and filling our home with song. Her creative eye, superb taste, welcoming personality, and loving touch are what make our house a home. Like working with Beyoncé, collaborating with Kelly always leads to a better, more dynamic, finished product. Also like Beyoncé, she is a gifted artist, with an incredible ear for music and eye for art. People are naturally drawn to her and she is the life of every party. She has a natural charisma and somehow manages to be both easy-going and attentive to detail. I am constantly amazed by her talents and consider myself immensely lucky to have won her heart years ago. The famous astronomer Carl Sagan said, “Extraordinary claims require extraordinary evidence.” To this end, let me provide a few brief stories that will give you a glimpse into the fantastic person and phenomenal mother-to-be that is Kelly. Kelly is widely known in our and our friends’ circles as being the go-to party planner. When we were in college, she worked at a children’s party-planning company, organizing big parties for groups of kids on weekends. In Boston, she regularly plans elaborate, themed parties and bakes cookies/cakes for friends, family, and even friends of friends. She could most certainly make a business out of this, but she does it for the simple joy of making a child’s birthday or celebration memorable. During the year that we were waiting for our green cards, Kelly was unable to work for pay. Rather than taking an extended vacation, she immersed herself in volunteer work at a local food bank. She started as just an extra set of hands, but very quickly became crucial to the operation of this small non-profit. In the year she has been there, she has taken the lead on scheduling/coordinating of volunteers, advertising/social media, website design/maintenance, and has organized a new type of food drive. As is her way, she has become an indispensable part of the organization in just a short time. 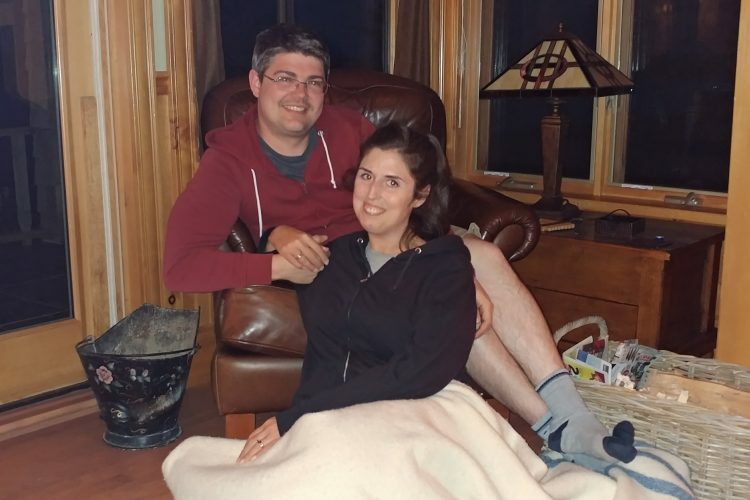 While the past several years have been extremely hard on us, with the loss of several pregnancies and the death of Kelly’s father, Kelly has emerged as a much stronger and more empathetic person. She understands grief like few other people, and has been enormously helpful to other friends and family going through various problems, big and small. I have no doubt that this will translate into her being an exceptionally caring and comforting mother, able to soothe everything from scraped knees to broken hearts with the softest and most understanding of touches. When I think about Mike, I think about laughter. Mike has a joy for life that bubbles over through his infectious laugh, his bright smile, and his cheerful spirit. He always knows what to say when I’m feeling sad or stressed, whether it’s telling a joke to lighten the mood, or being the steady, calm voice of reason. He is also my safety, my comfort, and the love of my life. When it’s time to be serious, Mike is a perfect balance to my wacky creativity. Mike’s passion for his work is something I truly admire. As an astrophysics professor for a top-tier university, he is always thinking about the best way to support his graduates, a new way to teach a concept to his classes, or just figuring out how the universe works! He’s brilliant, but he never makes people feel “less than” or intimidated. In fact, one of his greatest skills is helping people understand things in a way that is accessible to them – one of many talents that I know will make him a great father. One of my favorite things to do is watch Mike play with our nephews or friends’ children. Mike can double the fun in any fun-filled day! He has a child-like playfulness, as well as patience and delight, when it comes to playing with children. When Mike plays with the children in our lives, I see his future as a father. He loves challenging our nephew, Nathan, in sports or board games, while also encouraging him to try his hardest. When Mike spends time with our other nephew, Lachlan, joking around and being silly with him. Mike loves being silly and he’ll always do something “just one more time” if asked. You can see his heart melt when he gets a hug from a little one and the pride he feels when putting a piece of children’s artwork on the fridge. Mike is a dad without a child yet (cheesy dad jokes and all), with all the love and strength it takes to be a great parent just waiting to be shown. Mike is always loving, unwaveringly supportive, silly, and fun. I feel so lucky to have found my true partner in life in him. Mike shows his love for me every day, with a touch or a look, or even just by doing a chore that he knows I don’t like doing. I could not have designed a better man with whom to share my life if I tried. He is my best friend, and I cannot wait to start our family with him. Millie is our sweet Cavalier King Charles Spaniel. She has lots of practice being gentle with tiny humans, as she gets to visit the children of many of our friends and family often. Millie is very patient with small (and sometimes grabby or rough) hands, never showing any aggression or fear. Millie especially loves babies; she even tried to comfort our crying nephew once by quietly sitting next to him and his mom. We don’t anticipate much jealousy from Millie when a baby comes into our home, but we do plan to prepare her when a little one joins our family. Overall, we know she will be almost as excited as us to welcome a child into our home. Though we love to travel, we love being home even more! We’ve been in our sweet little cape house for nearly two years and we’ve truly enjoyed making it a home. We love having friends and family visit and hosting all sorts of gatherings! We have a large, fenced-in backyard with a path leading down to a small pond. We also live just down the road from a working farm where we can get fresh milk, eggs, and produce. We are fortunate to have lots of wildlife visit us daily, from songbirds and butterflies, to deer and bunnies! As for our community, our town is extremely family-friendly, with lots of family events happening all year long, and our surrounding neighbors are all very kind (we have neighborhood get-togethers several times a year). Additionally, the school district in our area is among the top 10 best school districts in the state. We feel very fortunate to live in such an amazing area and to be a part of such a warm community; we can’t wait to raise our child(ren) here! When we have the opportunity, we love to travel together and with our friends and family. As an astronomer, Mike has the opportunity to travel to wonderful locations, and Kelly often comes along! We also love traveling to Canada to see our extended family and friends, and are usually able to get there four or five times a year. We’ve been lucky to explore so many places, and we hope to continue exploring the world as our family grows. My family has two boys and two girls, Kelly, Dan, me, and Mallory (born in that order)! While we are all close, my brother is my best friend – we talk nearly every day. My parents, Gordon and Shirley, are already incredible grandparents to our two nephews, Nathan and Lachlan, but they are beyond excited to welcome another child into our family! My family still gets together for Sunday dinner each week, and, though we no longer live in town, Kelly and I try to call them weekly just to check in. The whole family can’t wait for us to finally call them to let them know that another child will be joining our family. I come from a huge extended family, and they all live within two hours of our hometown! Both my mom’s and my dad’s sides gather annually. My mom’s side has been going to the same cottage resort together every summer for more than 30 years! My dad’s side has grown to over 80 people, across three generations, and we all still get together every Christmas! It’s always a loud and loving party where we get to catch up with everyone and the kids get to run around together. We can’t wait to have a little one join our family fun! I have two sisters, Lindsey and Jaimie, and I’m the middle child! 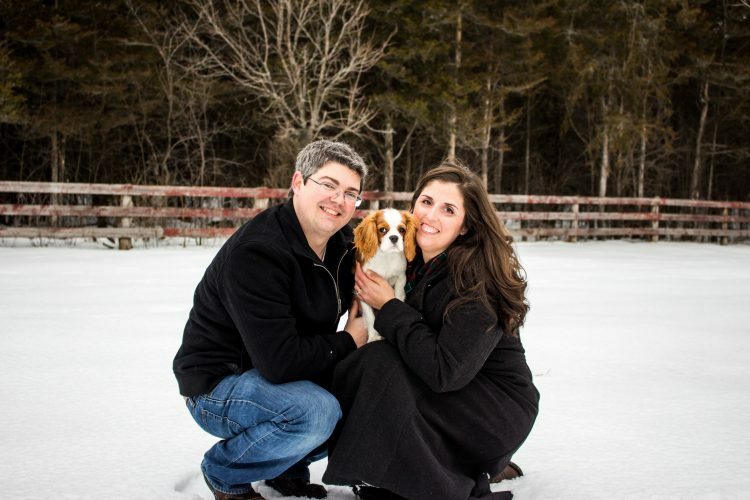 Lindsey lives in Nova Scotia with her partner, Todd, and Jaimie lives in New York City with her husband, David. We don’t get to see each other as often as we would like, but we chat on Facebook every day and Skype regularly! Though we sadly lost my father in 2014, my incredible mom, Wendy, (who still lives in my childhood home) visits us often for weeks at a time. There are no grandchildren on my side of the family yet, but we all cannot wait for a little one to join our family! My mom has a closet full of baby clothes and toys, just waiting for the right child to use them, and my sisters are looking forward to being aunties who can spoil their niece or nephew! My extended family is spread across Canada and the U.S., but my cousin, Maura, lives right near us with her husband, Hung, and daughters, Abbey and Maggie. It’s so nice to have family so close by, especially family with kids! We’ve known these two lovely little girls their entire lives – Abbey was even the flower girl at our wedding. I’ve also had the privilege of helping Maggie and her friends create a performance for their school talent show every year since kindergarten. These two girls are kind, sweet, and thoughtful; we feel lucky to have them in our lives and we know that they will be incredible examples to our child(ren) someday. Trying to separate our friends from our family is almost impossible. Our friend group truly views each other as family, as some of us have known each other since the second grade! We see this incredible group of friends anytime we visit our hometown in Canada, along with when we annually reunite at a friend’s lake house. Kelly has known most of our guy friends since elementary school and Mike has known them since he transferred to our school in high school. When he and his brother met this group of guys upon transferring, they became fast friends, dubbing themselves “MRS. BAD” – the first letters in their names: Mike, Ryan, Sebastian, Bryan, Adam, & Dan. Years later, we still refer to the group as this silly acronym! Through marriage and divorce, births and deaths, “Mrs. Bad” is as strong as ever. We treasure our time with this crazy group of best friends! 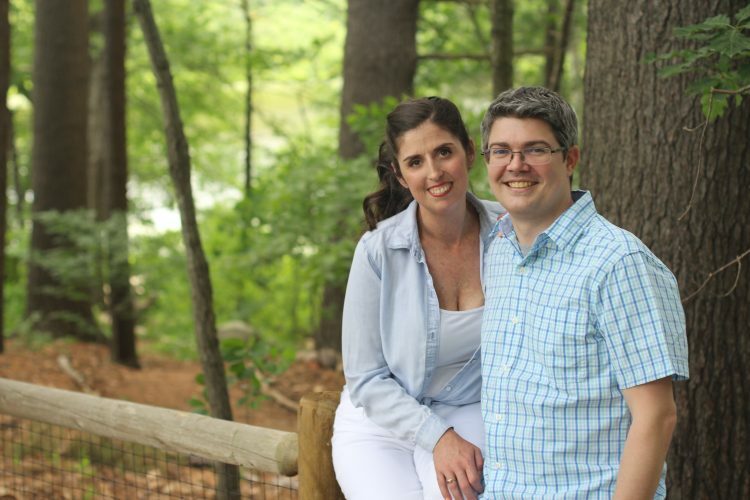 We’ve known our closest friends here in Massachusetts, Jamie and Vanessa, for over ten years now, and we are guardians to their children, Elliot and June. Elliott (6) and June (3) are bundles of fun! Elliott has un-ending energy, and loves being silly with Mike! Our sweet “bruiser” Junie likes to make her presence known, squealing with excitement whenever she sees her “Keppy” (as she calls Kelly)! We are so grateful that this family moved to the Boston area 2 years ago and we get to see them more than ever. Nathan (who was the ring-bearer at our wedding at 4 months old) was our first nephew and he was the only one for a long time. This 11-year-old has a huge heart, a ton of energy, and a sharp mind. He loves playing games with the family, and Mike loves playing sports with him whenever we visit! Our youngest nephew, Lachlan, is also our godchild. He will be two next January and is a special light in our lives. Lachlan was born with undiagnosed developmental delays, including impaired vision and speech delays. Though we’re all still discovering who this special, sweet boy is as a person, we know he loves lights, music, laughing, and snuggling! We are originally from Canada, so we grew up celebrating Thanksgiving in October, but that doesn’t mean we don’t celebrate in November, too! Every year, Mike’s brother, Dan, along with his family, visit us and we have a “Themes-Giving” – we choose a food and make the whole day themed around it! So far, we’ve had “Pizza-Giving,” “Chinese-Food-Giving,” and “Potatoes-Giving,” just to name a few! When the Thanksgiving feasts are over, we clear out the house and decorate for Christmas (and we LOVE Christmas, so we go all-out every year)! For the past 12 years, we’ve hosted an all-day open house holiday party, as a way for us to see our friends and family who live nearby before we travel back to Canada for the holidays. We’re fortunate enough to get plenty of time off to spend with our families every year, so we road trip up to snowy Canada. Mike’s family hosts Réveillon every year, a traditional French-Canadian Christmas Eve feast, and attending has become a tradition for Kelly’s family, too! It’s a wonderful evening spent with both families, and we can’t wait to experience this family tradition with our child one day soon. Spending time in “Cottage Country” is by far our favorite annual tradition – and a very Canadian one! Mike’s family has been traveling to the same cottage grounds for over thirty years – three generations even attend! For nearly 20 years now, we’ve also spent a separate cottage weekend every summer with our group of friends, “Mrs. Bad” as we like to call ourselves, at our best friend Sebastian’s family cottage. We are so excited to bring our adoptive child into these long-standing cottage traditions someday soon! We hope that through this letter we’ve been able to show you the happiness, fun, and love we have to share with a child. We are so excited to be parents one day and, if you give us the honor of placing your child for adoption with us, we know we can provide a secure and loving home to them. If you select us as your child’s adoptive parents and are open to it, we hope to maintain some level of contact with you, our adopted child’s birth family, whether that just be through brief photo/letter updates or something more frequent and direct. We would love for our adoptive child to know who his or her birth relatives are and for them to have an understanding of their heritage. We also want them to know their birth story, including how the decisions you made helped bring them into our family. This is because we believe that an open adoption can really help the healing process and be a beautiful experience full of love for everyone involved. Thank you for considering us as your child’s adoptive family. We appreciate you taking the time to learn about us, and we look forward to hopefully learning more about you! Know that if you choose us, your precious child will be loved and cherished more than words can express. If you have more questions or wish to contact us, please call Full Circle Adoptions at 1-800-452-3678.